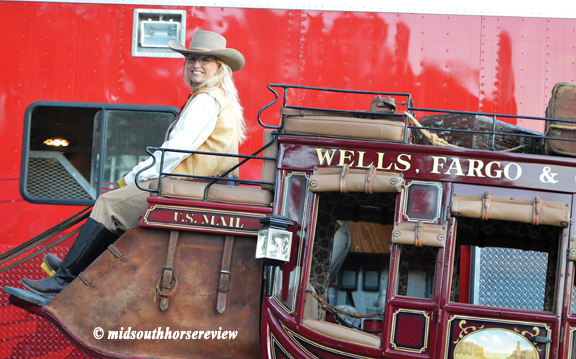 A special treat for visitors to the 70th anniversary of the Germantown Charity Horse Show (GCHS) was the Wells Fargo Stagecoach, performing nightly, with a separate Stagecoach on the grounds for taking photos of family and friends. 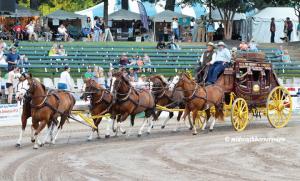 The stagecoach and six-horse team are a trademark of the company, and they make appearances at events all over the country. 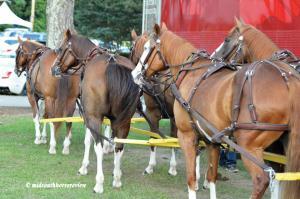 In fact, Wells Fargo sponsors three rigs: six horses each with stagecoaches and trucks. 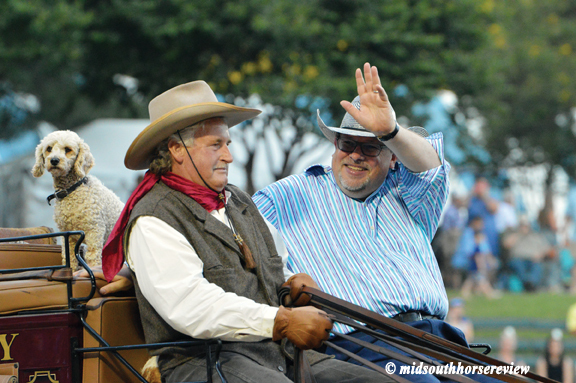 Alan Cartwright and his wife Georgia, who train and drive the Wells Fargo rigs, brought two teams, 12 horses, and two stagecoaches to the GCHS this year. 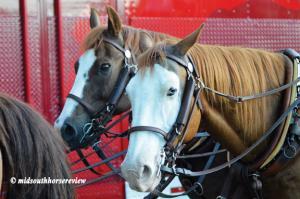 All the horses in the team are Quarter Horses and Paints – with a lot of white on them. They drive only geldings, which Alan calls “stocking leg” geldings (because of all the white on their legs). 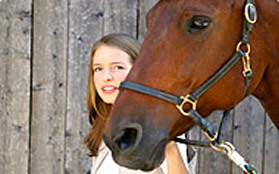 The pair own and operate the Cartwright Ranch in Fort Worth, Texas, where they have about 40 head of horses on100 acres. 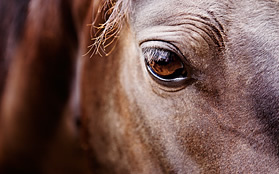 They also raise a few Longhorns, but “the horses keep us busy,” Alan said. They start training at about three years of age. “We expose them to everything we can, even fire trucks,” Alan explained. 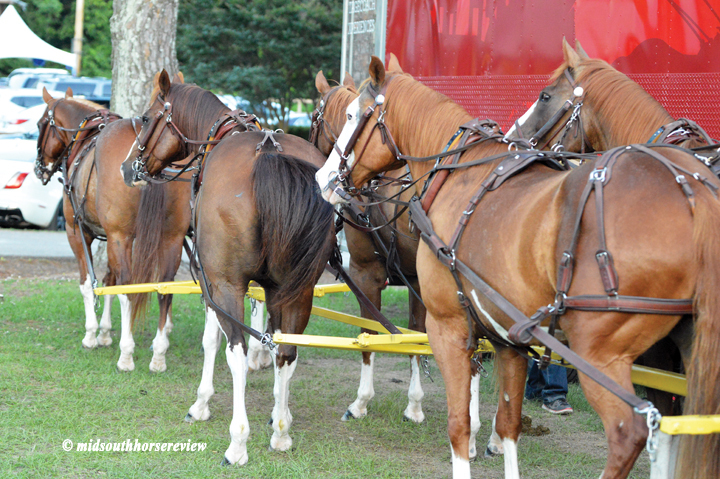 “We expose them to gun fire, fire crackers, balloons, and lots of John Philip Sousa music.” They drive the horses for two years at home before taking them to their first parade, at about five years of age, because “there’s no room for error!” Alan emphasized. Alan said the coaches are all built by Abbott and Downing in Concord, New Hampshire, thus the body style is called the “heavy Concord.” “You could haul 9 passengers in this coach,” Cartwright said, referring to the Concord stagecoach. Hanson also builds stagecoaches in South Dakota. 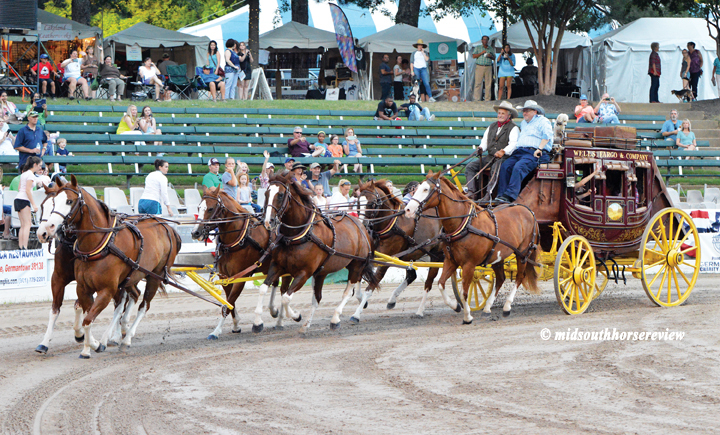 Alan started working for Wells Fargo in 1995 in the Stagecoach Experience division, but his experience with horses goes farther back. 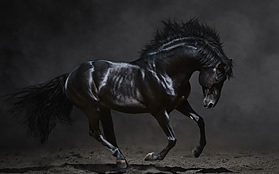 He grew up in the horse business, farming and ranching. At age 6, he learned trick riding and has been performing ever since. Alan says he enjoys the work and never gets tired of it. “We start early and stay late,” he said. Alan and Georgia travel with their teams across the country, mainly in the South – from Texas to Kansas and along the east coast. 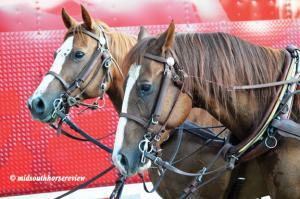 They have been to the Belmont Stakes and traveled to London in 2012 for a parade with the Queen. They also did some “touristing” while there, visiting the harness making shop, toured the Royal Mews, and met the driver of the Queen’s carriage. After the GCHS, the couple hauled to their next stops on the tour, one in Florida and the other to Louisville, Kentucky. The pair participates in about 100 parades a year. Christmas and 4th of July are the most popular times for their stagecoach appearances.